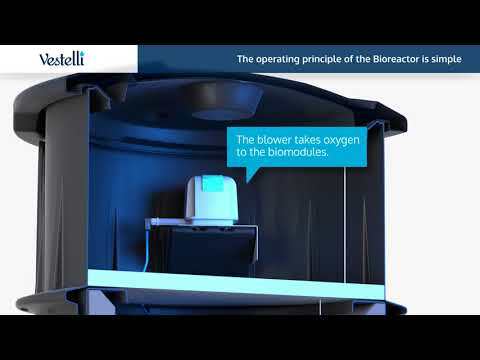 The Bioreactor treats all wastewater except for toilet water. Due to its precisely designed structure, greywater is treated in one tank without a septic tank or separate drain field. The treated water is discharged directly in to a ditch, stone pit or hillside. The Bioreactor does not have any replaceable filter materials, chemicals or soil. The only operating and maintenance costs are caused by the emptying of sludge which is carried out once a year, as well as the blower that consumes approx. 4€/month of electricity. As such, the Bioreactor is also suitable for winter use. The Bioreactor is a continuously operating greywater bioreactor, and its operating principle is simple. Its operation is based on the aeration of wastewater, which is made efficient by means of biological treatment. The biological layer that is accumulated at the surface of the biomodules enhances the treatment of nutrients in the wastewater. The Bioreactor has been independently tested for six years. The Bioreactor meets the strictest requirement level of the wastewater legislation 19/2017 in all conditions. You will always achieve an excellent treatment result with the Bioreactor despite the equipment level of your property, temporary use and relevant season – the environment will thank you. The only operating and maintenance costs are caused by the emptying of sludge that is carried out once a year, as well as the blower that consumes approx. 4€/month of electricity. The installation costs of the Bioreactor are minimal. The Bioreactor does not require a large drain field, tank or anchoring. In fact, the 1200-kg tank anchors itself better than anchoring plates or materials made at construction sites. Catharina and Henrik Westermark live in Southern Sipoo, right at the shore of Suomenlahti. Markku Vuorenpää lives with his family in Säkylä at the shore of Pyhäjärvi, where there are strict requirements on the treatment of wastewater.